Dale Smith is an Executive Vice President in Wealth Management & Securities Services at U.S. Bank. 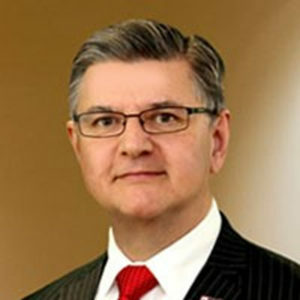 Over his 38 year career in financial services, he has served as systems analyst, project manager and development team manager within enterprise IT; corporate consultant for business process architecture; and currently manages U.S. Bank’s global securities custody operation and federated IT business units. Smith earned his B.S. with distinction in History and Computer Sciences from the University of Wisconsin in 1982 having been elected Phi Beta Kappa his junior year. The poetic license in Shakespeare’s “Histories” first led him to pursue his education focused on medieval studies, particularly 15th C. England, that remains a passion today. He serves on the Board of Visitors for the Department of Computer Sciences, the Operations Advisory Committee of the Depository Trust & Clearing Corporation, and is a director emeritus of the American Heart Association. Smith is a native of Milwaukee, Wisconsin, and resides in Jackson, Wisconsin with his wife, Allison.